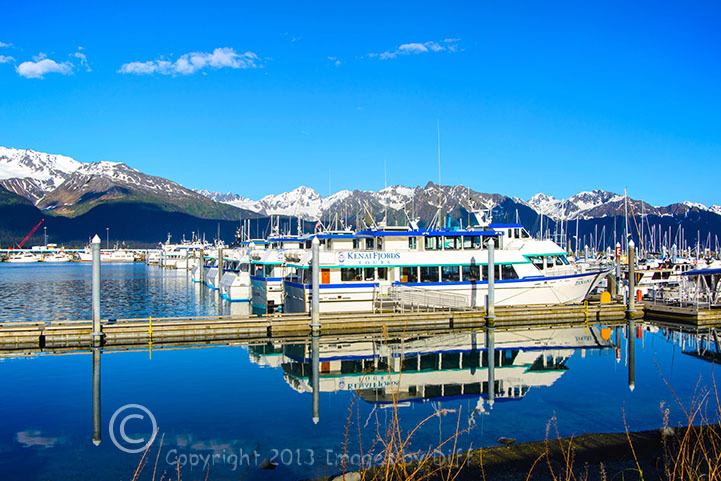 click photo to enlarge When we arrived in Seward, a bus took us to the dock for our 6-hour boat trip of the Kenai Fjords National Park. 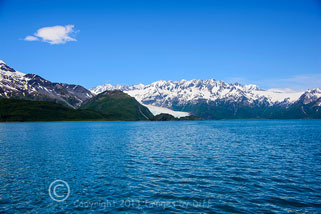 Soon after leaving port, we cruised into Resurrection Bay and Bear Glacier. 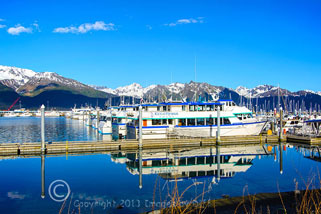 Resurrection Bay was used for the opening of the movie Hunt for Red October and was supposed to be Murmansk Fjord in Russia. Maybe this is where Sarah thought she saw Russia? 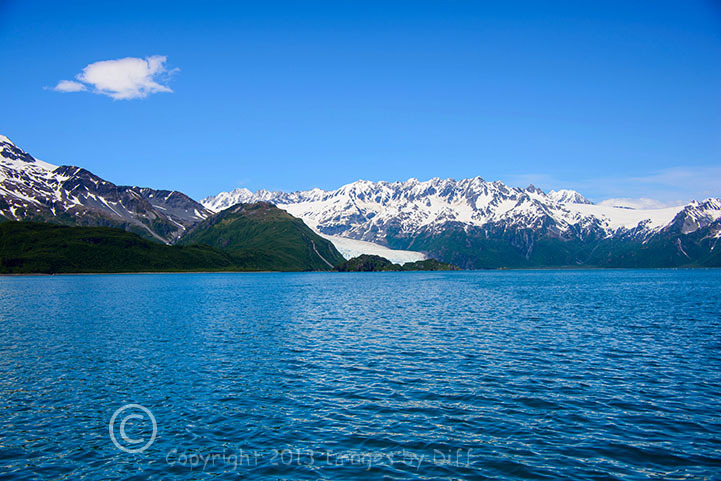 click photo to enlarge From there, the tour cruised into Aialik bay and the Aialik glacier. The boat got really close to the glacier and, as it did, it got cold. When a piece of the glacier broke off, you hear a loud bang like a gunshot. 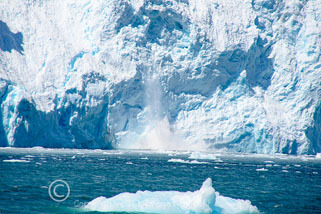 We were told the loud bang was air being released that had been compressed under the weight of the glacier. The ice really is blue. The reason the ice is blue is because the ice is so compressed, it absorbs all other wavelengths except blue, so you see blue. The tour also included an all you can eat salmon and prime rib buffet that was quite nice. In 2010, we were in Glacier National Park in Montana, but you have to hike for miles, if you want to get close to those glaciers. We did get to see a couple whales on this boat trip, too. 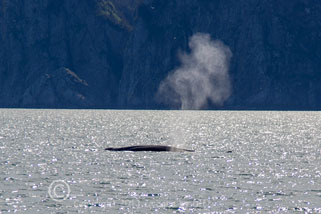 click photo to enlarge The boat tours also make sure they have time to look for whales because many of them have a guarantee you will see a whale. 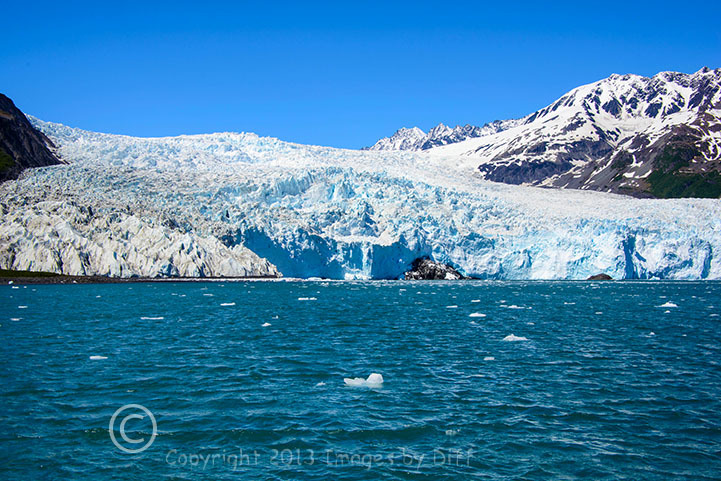 This Alaska trip was really the first time we had ever seen glaciers where you would actually see how they slide down a mountain like a frozen river. You learn about this kind of thing as a kid in school but until you see it in person it is kind of hard to picture.